Machines both fascinate and frighten me. Sometimes their impact seems to overwhelm the presence of the very people who created them. This sparkle snow globe, Men at Work, illustrates that feeling. Just who is in charge, anyway? what are we trying to accomplish? When shaken, the scene is bathed in shimmering gold dust … until the dust settles, and the work begins again. 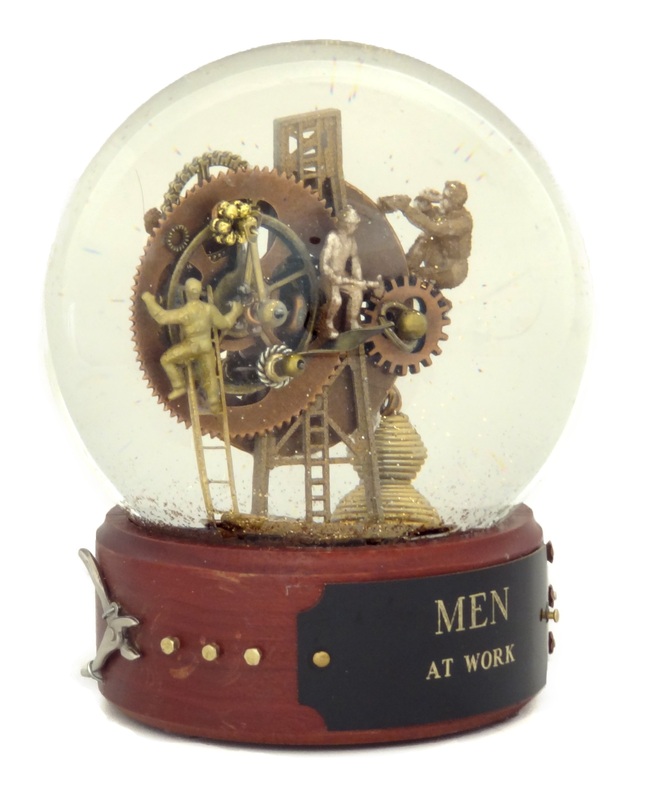 One of a kind snow globe/sparkle water globe with interior assembled sculpture of tiny men, gears, machines and tools. All images and designs copyright (c) 2015 Camryn Forrest Designs, Denver, Colorado. This entry was tagged artisan snow globe, Camryn Forrest Designs, curious invention, custom snow globe, custom waterglobe, miniature sculpture, mixed media, Science Fiction snow globe, steampunk snowglobe. Bookmark the permalink.